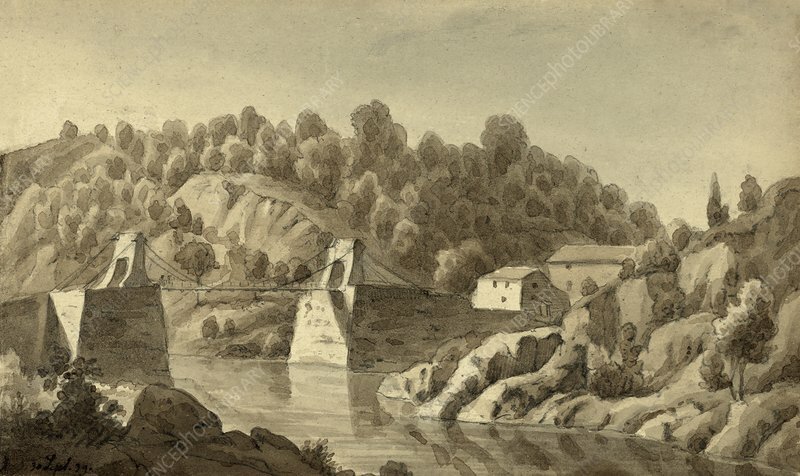 Chain Bridge at Little Falls, Potomac River, USA, 19th-century artwork. This is the fourth bridge that was built at this location, connecting Virginia (right) with Washington DC (left). The first bridge had been opened in 1797, with the third bridge being of the chain suspension type seen here that gave rise to the bridge's name. The third bridge was destroyed by floods in around 1812. The fourth bridge lasted until 1840. At right are the warehouses at Pimmit Run, a stream entering the Potomac River. This wash drawing is by the German-US artist Augustus Koellner (1813-1906). The date (given at bottom left) is 30 September 1839.